Bill came over to check on me this morning at the church. He handed me a little white bag. "What's this?" I asked. Inside the bag was a tasty pastry. That's total blow-my-socks-off "wow"! Just another example of the North Branchers' generosity. This morning I biked through Yale, MI. I stopped outside the library and sat on a bench. It was the halfway point for the day and a good place to catch up on my blog. I was unable to tap into the library's wifi (apparently you need a password), but I could still get some work done. A little later, librarian Lori came outside to ask if I was able to access their wifi, as their system appeared to be down. This sparked a long, friendly conversation. We talked about biking, Lori's son in Chicago, and Lori's aspirations to be a published author. We also talked about how the element of "play" is so crucial to loving whatever it is that you do. Anyone who realizes the importance of play is definitely an awesome person in my book. I'm glad the wifi was down and so that Lori and I could have the opportunity to share some stories. As I've mentioned earlier, I don't always understand the intentions behind the routes for the Adventure Cycling maps that I'm using for this trip. For the second time, I decided to go off-route. I headed east from Brockway towards Avoca so that I could travel the entire 12 miles of the Wadhams-to-Avoca Trail, instead of just the 3.5 miles indicated by the map. I decided to do this for two reasons: 1) for a change of scenery and 2) to get the heck out of the winds I'd been riding against all day. The trail was a treat. It was crushed limestone for a majority of the route - but a very easily manageable crushed limestone. 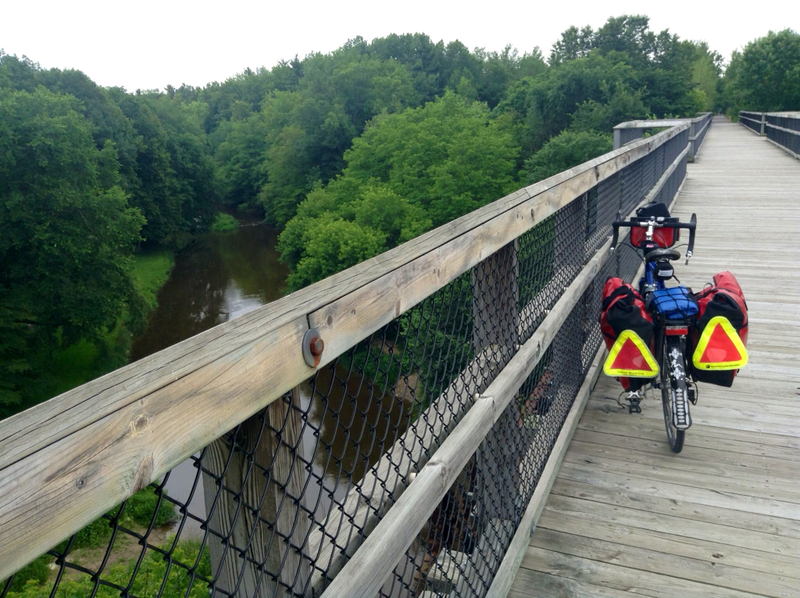 The Mill Creek Trestle on the Wadhams-to-Avoca Trail. My Warm Showers host for the evening was Bonnie. Bonnie used to be a library person, and so she knows the Lori I talked to in Yale. No kidding! Super small world! Bonnie shares her home with her son and his family. She lives in an adorable mother-in-law unit off the main part of the house. I stayed in Bonnie's living space, on her futon. Bonnie and I spent a long time chatting. 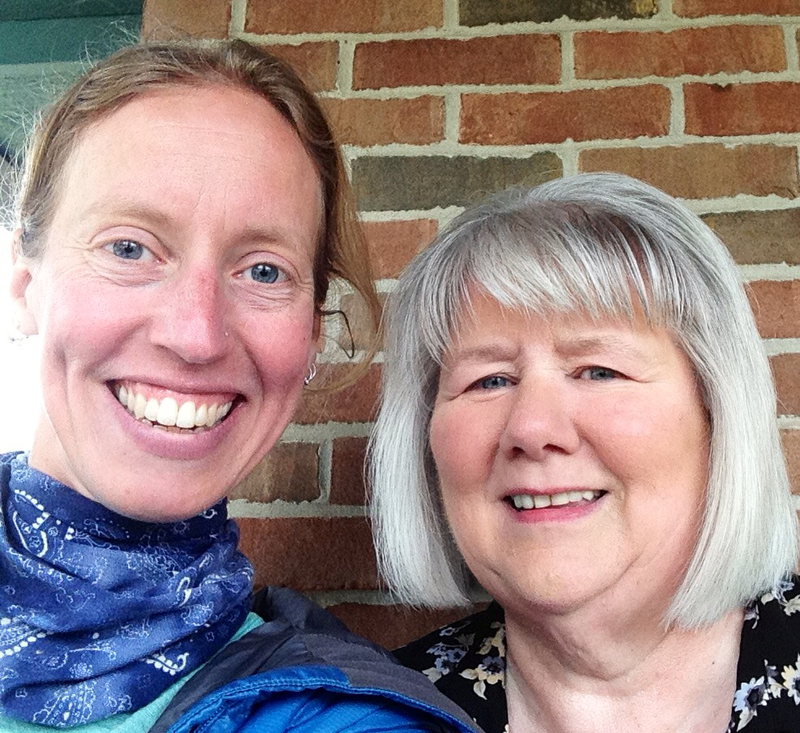 We talked about her recent two-year tour of Azerbaijan with the Peace Corps. We also talked about her trip last year down the entire coast of the Atlantic Ocean. Her trip had been with Adventure Cycling, and so it was interesting to get her perspective as a trip participant. 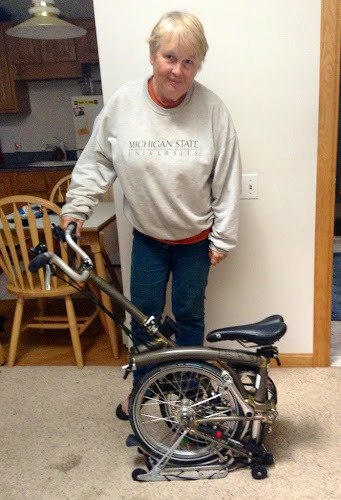 Bonnie gave me a show-and-tell of her favorite bicycle, her folding Brompton. She said that if she could only have one bicycle, this would be her bike of choice. The bike is fantastic; because it folds, it's easy to travel with, particularly on trains. In fact, she rode her Brompton around the Selkirk Mountains (a bike trip I also did a few years ago). I joined Bonnie's family for a yummy burrito dinner. Bonnie's daughter-in-law has rock-solid cooking skills and whipped up the best guacamole and salsa. We sat around the table after dinner and chatted more as we indulged in our food comas. As I'm meeting more and more people on this trip, I'm learning that this trip is less and less about the biking and more and more about the wonderful people I'm meeting along the way. Hi, Sarah! I'm enjoying reading about your travels and all the cool people you're meeting. You inspire me! Yeah! Glad to hear it, MaryJo! What kind of fun are you having tonight? Fireworks? Or are you still in Canada?? ?